Gaana+ Premium Subscription:- Hi there. Welcome To BigTricks. Hope you guys are enjoying our previous offers and deals. Here’s one more offer. If you are a music lover, you’ll love this offer. 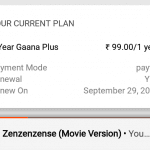 TimesPoints is offering Gaana Plus Subscription free for 1 year on Signup. You don’t need to spend any rupee. 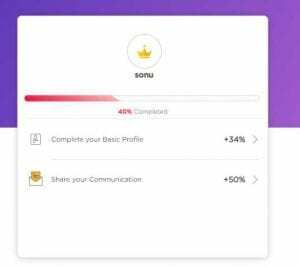 Just Signup, Complete your Profile & Get 120 Points. Now Redeem 120 Points to Get the Gaana+ Premium absolutely free. This is Verified & Proof Added below. 1. First of All Visit Timespoint Website & Signup Now – Click here. 5. Done, You will get Free Gaana+ Subscription for 1 Year. 6. You Can Use This Code in Gana Account & premium membership will be activated. 7. You can Create Unlimited Accounts & Get Unlimited Gaana+ Vouchers. 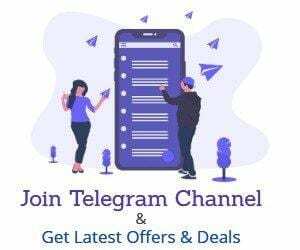 Coupon code can be redeemed on Gaana till 31st December 2019. Unclaimed Vouchers stand no value post this period. Gaana+ is a premium subscription service from Gaana.com. Gaana+ users are allowed to download unlimited songs on mobile devices. With this offer, customers will get 365 days Gaana+ subscription free of cost. To apply the coupon, open the Gaana App > Settings > Redeem Coupon>Enter Coupon Code. The offer can be used only once by a user and will be valid for 3 months from the time of redemption of coupon code. 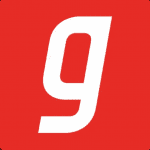 Gaana.com/Timespoints reserves the right to terminate, modify or extend this offer, at any time at its absolute discretion, without assigning any reason. Offer subject to promotional availability. This offer has no monetary value, is not transferable, is not for sale or re-sale nor redeemable for cash. Gaana is the one-stop solution for all your Music needs. Gaana offers you free, unlimited access to all your favorite Hindi Songs, Bollywood Music, Regional Music & Radio Mirchi – on your mobile phone, no matter where you are. 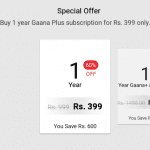 They are offering 1 Year Gaana+ Premium Subscription for just Rs. 99 which normally costs around Rs. 399 for a year. So what are you waiting for? Hurry up and grab this offer before it expires. Download and install Gaana app from here if you don’t have it already. Open app and login into your account or create a new one. Apply this coupon code:- IIMUDAIPUR & You will see like below. 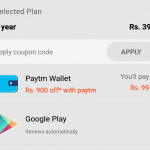 Pay Rs.99 Using PayTM & Get Gaana+ Subscription for a year free. Now go to Menu >> Start 30 Days Free Gaana+ Now. Here, you’ll see Rs. 399 plan of one year. Click on it. Now pay remaining Rs. 99 with your Paytm wallet. After successful payment, 1 year Gaana+ Subscription will be activated on your account.